AMAZE ME MONDAY #1 ~ She Turned Out Pretty! Welcome to AMAZE ME MONDAY #1! I am so glad you are here because I've got something to show you! Make Me Pretty is FINISHED! I used AS Chalk Paint. Two coats of French Linen and then a wash with Old White. I will say...it was NO fun doing the inside with all those cubbies! So, what do you think...didn't she turn out pretty! can't wait to see what you've been up to! 1. Place a a link to this party in your post. 2. Please be a follower of this blog through GFC. 3. Copy and paste the web address of your post NOT your blog home page. 4. Please link new posts and limit to 3. 5. Please visit a few other links and leave a sweet comment. I am so glad that you took over and brought back Amaze Me Mondays!! What a fantastic make over and what a beauty you have on your hands there!! The transformation of your little desk is beautiful! Great job!! Thank you for hosting this new party! Thanks for the invite, Cindy. Love the desk. I'm so glad you're hosting the party Cindy. I LOVE the transformation of your desk! Beautiful! Beautiful desk. Thanks for inviting me over. Following you now. Yes, it came out beautiful, Loving your desk!! Thank you for the invite to your great partyand for the sweet comments! Have a good week. Cindy that turned out so beautiful! It has a dreamy romantic quality about it! Thank you for inviting me over! So glad to join you! Thanks for hosting! Your desk turned out beautifully! I'm so happy that you are hosting a party and that I can participate. Oh my, Cindy, your little secretary looks so lovely all dressed up in her new paint. You are such a sweetheart to become the hostess of this party. I wish you much success! Cindy she's a beauty!! Thanks so much for hosting! The desk turned out great! Thank you for hosting and I'm your newest follower. Hi Cindy, What a beautiful transformation on the little desk. Love the color! I don’t think she will be in the shop long. I must confess I was impatient to see what you did with your damaged piece. It turned out lovely! I'm really impressed, given the state it was in. Thanks for inviting me to the party and be assured I'll come back. I'm off to check some links on my lunch break. Thanks for the party invitation -- can't wait to see the other links. Cindy, she is lovely! What an amazing transformation you've given this piece. 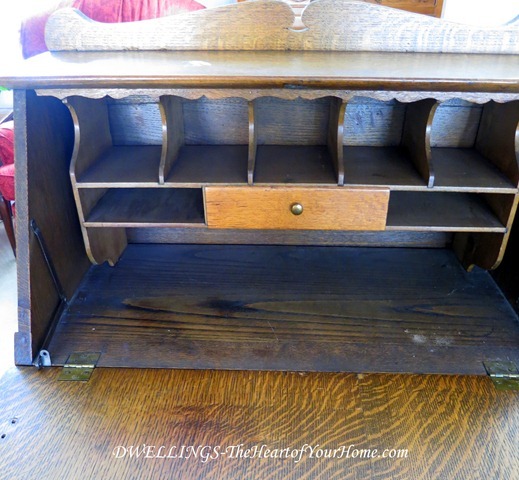 Isn't it wonderful that this darling desk now has a new life. Thanks for inviting me to join in your Monday party. Hi, Cindy! What a transformation! I love how your little desk turned out. So glad to be partying with you! It turned out great, Cindy. I know it will soon be a very special treasure for some lucky person. Thank you for inviting me to your new party. Best of luck! Beautifully done, Cindy! I love the size of this piece, too. Perfect for those of us in condo's. Oh Cindy, your little desk is gorgeous! She is a delicate little thing and white was the perfect paint for her! I love it. 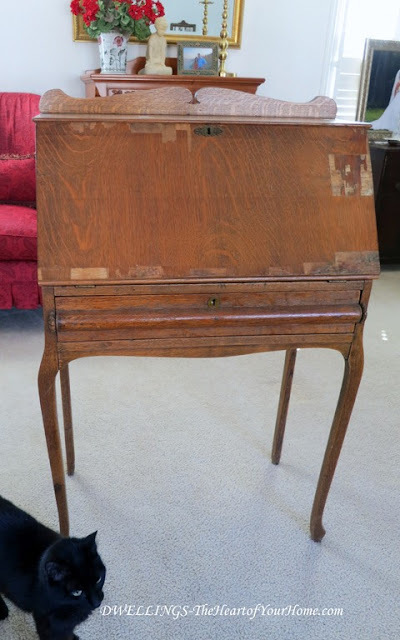 When I was a teenager, I loved old furniture then, like I do now and someone gave me a desk almost like that. I left it somewhere over the years, when I saw this I was reminded of my first antique. Your desk looks gorgeous! What a great job! You did a gorgeous job on the secretary. I'm particularly impressed with those cubbies. 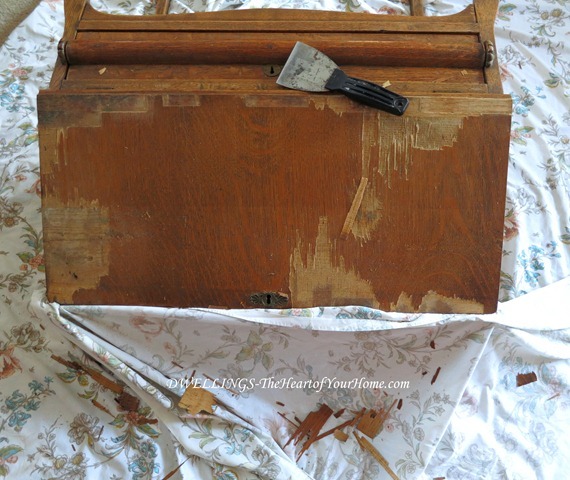 I'm always so messy with painting the inside of cabinets, drawers and cubbies. Thanks for inviting me to the party. first time joining your party, thank you for hosting and your secretary looks phenomenal! love it! thanks for hosting! What a awesome transformation! It really turned out looking beautiful! Fantastic job on the secretary. That takes a lot of persistence! Thank you for hosting the party. I just became a new follower. I love that secretary and she turned out gorgeous...you did a great job...thanks for hosting! Congratulations on being the new host for "Amaze Me Monday;" I'm looking forward to linking to your party!! Your secretary turned out soooo pretty -- great job!! I love old pieces like that, and you chose a great color. You really have a lovely home. I apologize for my delay in leaving you a comment. I ALWAYS leave a comment for the host as soon as I link on to a party; but last night it was sooo late when I linked on, I just went straight to bed. :) Thank you for hosting, Cindy, and have a wonderful day! Hi Cindy, I agree you did an outstanding job on that gorgeous old desk. Love the new look.